The fact that a lot of our work comes from recommendations is a testament to our quality workmanship, and our ability to maintain friendly customer relationships. 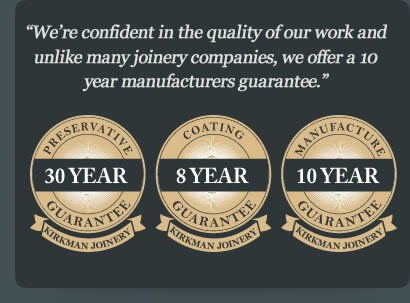 At Kirkman Joinery we are committed to providing a personal service, with an emphasis on the needs of the customer. And unlike some companies, we also offer a 10 year guarantee on the product as a whole. We ensure all of our customers get the same treatment no matter how big or small a project may be. We conform to all latest standards and offer a guarantee protection scheme for extra peace of mind. Our guarantees are supported by the GGFI, providing protection should any company stop trading before the expiration of the guarantee. We are also a FENSA and registered company, ensuring we deliver quality joinery products in line with current regulations, and that you get greater protection when purchasing windows and doors for your home. Kirkman Joinery are a member of the British Woodworking Federation, meaning that we are up to date with the latest developments in product standards, technology, and legislative and technical issues to provide you with the best possible knowledge and service.